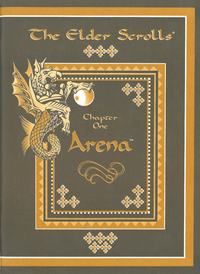 The Arena Player's Guide is the manual included with The Elder Scrolls: Arena. The Player's Guide contains information about how to set up, run, and play the game, as well as information about the game world. The sections of the manual are summarized below. Before the actual start to the manual, there is a short story based on the introduction of the game itself, a conversation between Talin, the Eternal Champion, and his murdered friend, Ria Silmane, providing exposition on the game's plot. A message from the Chief Designer, VJ Lakshman, introducing the Elder Scrolls to the reader. Information on how to install, configure, and begin playing the game on DOS. This section explains what each of the three main menu items do when you select them. This section explains how to create a player-character, and selecting their race, class, stats, and face. This section shows what the player management, equipment, and spellbook screens look like and explains what each section and label means or represents. This section provides information on each of the playable races, their homeland, their culture, and their abilities. This section explains what each class and sub-class is capable of, including what weapons they can wield, armor they can equip, starting health, and their abilities. This section contains a table showing what gear each class or subclass begins with when starting a new game. This section contains a table listing the experience points required for each class or subclass to advance to the next level, up to level 10. This section explains what each color that may appear behind the character's face on the UI means. This section explains what each button on the UI does, how to use the mouse, and what the keyboard commands are. This section goes into detail about the dating system and holidays of the Tamrielic calendar, talking to NPCs, finding quests, what each store or service may provide and how to negotiate with them, types of armor and their stats, summaries on each of the various guilds, and the consequences of thievery and crime. This section explains how to use the continental world map and describes the dangers of exploring the wilderness outside the cities and how to use the local automap. This section shows what the spell creation screen looks like, what each section and label means or represents, and how to make spells. This section also describes every spell effect and how to cast spells. The final section in the Player's Guide lists every spell available to purchase from the Mage's Guild, their effects, and how much spell points they cost to cast. This section also contains information on how to fight with weapons rather than spells, after-effects of combat, such as diseases, curses, etc., a bestiary of several of the monsters that can be encountered in the game, and general hints and tips on how to play and run the game. A copy of the manual can be downloaded here. This page was last modified on 8 September 2018, at 07:39.